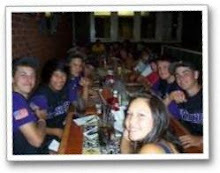 A grand celebration for Lake Stevens Baseball players at a season ending party. Fantastic food, slide shows and music marks the end of an era for many of these athletes some who've been playing baseball together since grade school. Best of Luck to each of these guys as they go forward and discover new and exciting fields of dreams. The 2008 ALB Junior State Champions ended their 2009 Season at the Division Tournament this summer. Enjoy some video highlights below from Lake on the field at the Division Tournament in Skagit. Another great season of baseball for these young athletes.